Solar Control can be achieved through 3M Window film. Glare can be greatly reduced. Heating and air conditioning costs can be reduced with the application of one of 3M's variety of solar control films. UV rays are reduced by most films by 99 % eliminating the harmful effects of the UV rays on carpeting, drapes, art, furniture and other furnishings. Decorative Films can be used in the building to make updated creative environments. Graphics on film can put any picture on a wall at any size. Fasara films can be used to add privacy and beauty. The films can be die-cut or custom printed. Di-Noc can be used to remake surfaces such as pine into teak or paint into marble. There are hundreds of surfaces to choose from. Solar Vision's Mission Statement is to inspire a passion for and generate living and working environments that are comfortable, safe, energy efficient and innovative. Let Solar Vision's staff inspire you. Window film uses in churches add to their beauty, safety, and energy efficiency. There are few things more beautiful than a stained glass window. The window creates a worshipful environment and help to set the tone in the church building. Stained glass is very expensive and not all churches have the resources to have them. Window film can be used in place of stained glass to give the church the atmosphere it wants. Traditional art can be used or modern art can be used. Any picture or any graphics can be imprinted on the film and put on the glass at a fraction of the cost of stained glass. The picture can be on one side or both sides. A picture can be made so that one can see through the glass on one side and have the picture on the other. Logos and murals can be put up on any flat surface of the church. Some churches are mixing new art with the more traditional art. New technology is used to create whatever look the artist imagines. Bible versus can be used to remind people of messages the church wants to emphasize. Solar control window film will cut down on energy costs and if there would be film breakage because of something like a weather event, the film would hold the glass shards together and prevent injuries. The film cuts down on glare and protects furnishings from harmful UV rays. Unfortunately, sometimes churches are targeted by vandals. Anti-graffiti film can be placed on signage or windows to prevent vandals from ruining the sign or glass. Safety and security film can be put on glass to prevent break-ins. Because some of the time no one is in the church, the church may be a target for robberies or vandals. The films give an extra layer of protection. The window film is used in retrofitting situations as well as new construction. It is easy to clean. Our Solar Vision mission is to inspire a passion for and generate living and working environments that are comfortable, safe, energy efficient and innovative. If you have any design needs, comfort, and/or security needs in your church, please call Solar Vision. Our staff will work with you to meet your needs. 3M Prestige 60 is covered by the 3M Lifetime Warranty. Shelley did a fantastic job talking about Solar Vision and 3M Window Film on Colorado and Company. Heath and Ben did the installation on the video and Lucinda did the sales. 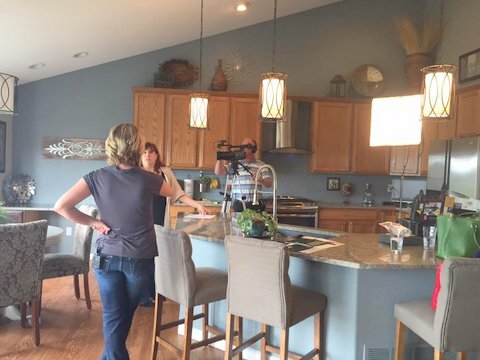 A special thanks to Lisa and Steve Strother who let us film in their home and to Lisa who was interviewed.Shelley demonstrated with a heat source in a box and glass with 3M Prestige window film applied, other window film, and glass with no film. She showed how well the 3M Prestige window film performs. 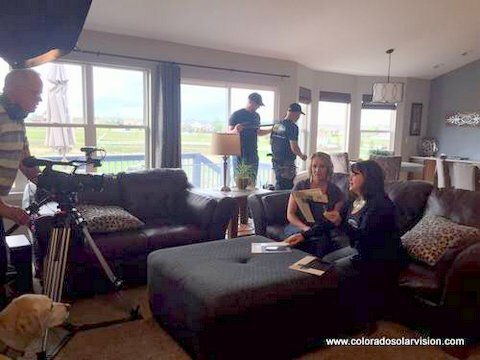 Solar Vision's TV Debut will occur on Wednesday, May 13, 2015 at 10:00 A.M. A video in the home of a Steve and Lisa Strother was made to appear on Colorado and Company. 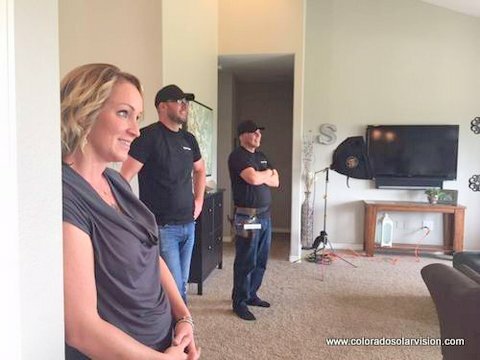 Heath, Ben, and Lucinda are on the video along with the home owner Lisa Strother. Shelley will appear live on the show and be interviewed by the host. 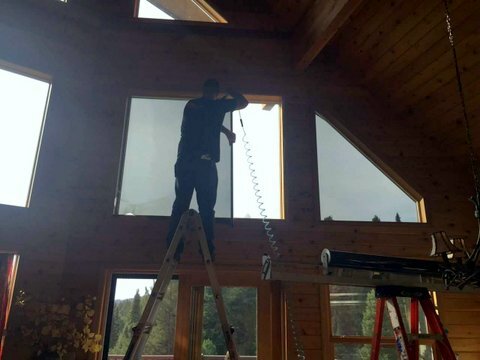 The church members at Father Dyer Church in Breckenridge asked Solar Vision to apply samples of 3M Night Vision to make the church more comfortable and still maintain their gorgeous view of the mountains in the area. Father Dyer Church is a historical landmark. It is 133 years old and is an active Methodist Church. 3M Night Vision comes in 3 different shades. The 3 samples were placed on the window and the people of the church will decide which one best meets their needs. This is one of the ways Solar Vision consults with clients to help them choose the best window film to meet their needs. 3M Night Vision helps block the suns rays and reduces glare and heat. Natural light still enters the room and the outside view can still be enjoyed. As always 3M backs their window film with their lifetime warranty. Window film also eliminates glare on whiteboards. The film protects occupants from harmful UV rays which can cause skin cancer. Some rooms may require a combination of window film and blinds. When the blinds do not have to be closed, natural light enters the classroom. Students learn better in natural light. Eyes get less tired. We know that students learn better in natural light. Attendance and behavior is also improved. (http://www.healthyschools.org/Daylight.pdf) Window film still allows natural light. A new 3M Window Film is 3M Daylight Redirecting Film. If you have just the right space, the film brings in more light at the top of the window and redirects it to the room. This lessens the need for artificial light. I worked in some areas where we took data on the behavior of students. Graphics or mirrors can be put on the window to observe students undetected. The graphics are made with tiny dots. On one side you see a picture. On the other side you can see through. A mirrored film can be put on a window and from the other side observations can be made. This could work well when the dean's office has a window to the cafeteria. The possibilities are endless in the school. A smart film can be turned on and off. When it is on the film is frosted. When it is off the window is clear. Think of the many uses for offices like the principal's office. He/She can see what is going on when it is off and can have privacy when he needs it for conferences with parents, teachers, students, etc. Black out film can be used in athletic viewing rooms to eliminate screen glare. Solar Vision has installed this at a number of colleges and universities. A film that is not a window film, but is an architectural film is Di-Noc. Some Di-Noc contains silver which cuts down on the growth of bacteria. In areas, such as the nurses office and preschool classrooms, the film applied to smooth walls may help reduce the spread of germs. Solar Vision can do a study of how window film can save energy and help you plan ways to use window and architectural films in your school. 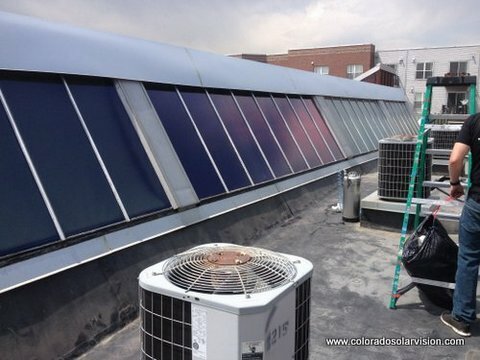 If you would like a study done, give us a call at 303-862-6376 or e-mail us at info@coloradosolarvision.com.